We have arrived at Old Tasio’s house. It is not a comparatively very big one, but the insides feel more like a large library than a domicile. We have been here once before, on the day of the dead. On that day I had also conveniently been away from my home so Sisa, Basilio, and Crispin could in privacy light candles in front of the barrel shrouded in purple satin. In Manila, you are honored to be buried next to the church, ah! And so, why then do the servants who work there have no problem with it? But fine. I gave them a promise of about two or three more days, and then I send the body away to Manila. If just on the matter of getting a burial, perhaps Pedro’s body could be donated to science, and then buried with the blessings of the Dominican priests after the handling of their students of medicine. … it was just that I had no idea if this would only insult Pedro further and keep him from haunting me. Can you imagine if I were on my marriage bed and then there’s this ghost hovering nearby, leering and… no. What the hell. Is this some sort of ‘do not murder people for the sake of convenience’ preventative measure? There are a lot of dictators and mass murderers who do not suffer even a smidgen of this hassle. Though I presume they are only metaphorically embodying the soul of their nation. Googol places a soft paw on my arm. All will be well, his grin seems to say. He barks: Now speak to us about food. Sisa, to show her gratitude, has decided to act as a housemaid in Old Tasio’s house until her house is rebuilt. I have asked for this lunch that they prepare bulalo – that is, beef bone marrow soup. While not a very demanding dish to prepare, Sisa gave it nearly fanatical attention. Allowed to simmer for at several hours for a rich soup, what would normally be tough muscles still clinging to shanks becoming incredibly soft. Just fifteen or so minutes before serving, throw in round cabagge and pechay (leafy green chinese cabbage) and young corn, and seasoned simply with black pepper. It is a strong and hearty meal. I behold the bowl with undisguised delight. “So simple the ingredients, yet you cannot believe how difficult to find in Europe. Batangas bulalo is said to be the best, but that is only a bit south of us, and our cows are not very different. Pechay and corn, without these it just does not taste right. What makes it most different is the quantity of the meat, how long you spend boiling the meat! If one wants bulalo for lunch, then one had best start boiling it before breakfast! Not too hot either, lest you steam away the flavor and melt the delicious bone marrow! “No, I have only been a bother to your family. The padre cura, Padre Salvi, has for some reason decided were are to be enemies, which is… ehhh,” here I gesture in the air with my palm down “We are both young men, either it will pass or keep things interesting as we advance in years. Don Anastasio, I apologize again for my careless words from yesterday, trying to pay for the ingredients as long as I entreated what specifically to put on your table. As you said, I am trying to accrue too much responsibility to myself, it is too arrogant and presumptuous, and futile besides. To share our troubles with others is what makes a friend! “Your humility does you credit. It reminds me much of your father, the world is poorer for his passing. Allow me to thank you as well, Senor Ibarra, for inviting me to this meal,” speaks a young man with a tired face to my left. Sensing the conversation was about to head off to weightier matters, which Sisa’s character did not allow her to listen into, she asked to be excused. She could not share the table, for not only was it considered improper at the time for the hired help to dine with their employers, she felt unworthy of it. Her departed husband was like her god whom she could not disobey in anything, except in that day she could only protest about her incapability of giving him what he wanted; and on that day he died and some irrational part of her felt it was a price for her disrespect. The woman was the light of a home, a father its walls, and with her home burned and its walls literally gone, had she not her children to cling to she would have gone senselessly cold and lost. “As- as you wish, Senor Ibarra!” she hurriedly replies. Away she goes, almost to flee. “… yes. Yes they do.” Oh, right. A part of me forgot that simply making the sign of the cross before eating was not enough. The future is ever in a hurry, but I have a full thirteen years before the century turns. Losing sight of the present from being enamored with the future is one of the worst things one can do; gamblers lose themselves in this, not just at the tables but at the stock market, and whole families are lost when all you care about is the money to make their lives more comfortable. Basilio looks terrified, while the teacher Navidad looks kindly upon him. During the time he was sick, only Basilio came to visit him, but to say why he too left school. He had become a sacristan, and he was told that it was not good for sacristan to frequent school too much, that house of secular concerns, for it reduced their esteem. The teacher clearly did not blame the boy. ‘Don’t use borrowed clothing with me‘, he said, ‘Be content to speak in your own language and don’t spoil Spanish, it is not for the likes of you!’ The shame and humiliation I felt then! I longed to reach out, and avenge myself, but burned only with my inability. For how could I go against the priest, the first moral authority? Anything I might do would paint me vain, and arrogant, and a bad Christian, badly-educated and even anti-Spanish! Though I might feel it is the law, and that it would be good for the students, under reproach one needs humiliation and resignation. Without the graces of the good cura, I could not even collect any of my pay. So I abandoned myself to my fate like a corpse upon the waves. Don Anastasio was my succor in these times, and for this I can never repay. 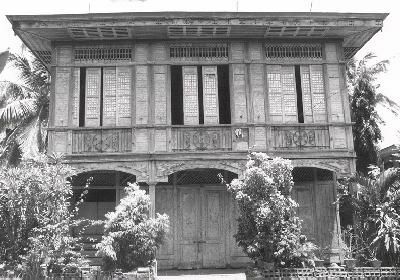 In this house, I was enlightened of how much more I was ignorant, and the pain of chastisement by Padre Damaso faded in the knowledge of my foolish arrogance over an incomplete understanding. And yet there remained the pain of knowing that if one does not start somewhere, one cannot get anywhere, and we are all denied even that. Don Anastasio, you know how in my studies I have become horrified with the old system. Whippings have long been a distinctive feature of our schools, and considered the best way of making pupils learn – but instead of encouraging students to take the role of heroes, and reach out for greater possibilities in their life, instead they are robbed of their self-esteem. When I had attempted to cease whipping students, they came to class more frequently, and when praised in the presence of their peers, were pleased and would learn more. Rather than fear being beaten for being wrong, they dared more to be correct. Again I was criticized for this! Parents told them that if I were to spurn the habits of our ancestors, children would be spoiled and become disobedient, they would learn nothing; and so they threatened to pull their children out of school. Young Basilio, you have seen this happen! When I had begun to resort to beatings again, I had seen the betrayal and tears, and I wish I could have wept with you children! Yet the cura had threatened to tell the alcalde about me, and I could do nothing. I have tried to treat you all with all leniency as possibly, but the time for reform is long lost! “Maestro Navidad, children, Ginang Sisa, I will not couch my plan in mystery. I mean to build a school! Until a school is built away from under the roof of the convento, it is inconvenient and incommodious for all involved. Spanish and Spanish works must be taught, this is the law. But Juliano, if there is the most useful thing I have learned in Europe, it is this! Being proven wrong is like being punched in the face. And I do not mean it feels like being punched; emotionally, being proven wrong is worse! Pain in the flesh is passing, the hurt from being shown stupid lasts longer. The teacher looks numb and wide-eyed at me. He blinks several times, then places a fist over his chest. “You are correct, Don Crisostomo, I had felt much the same way when my studies have revealed to me that I was an ignoramus, I had attempted to teach Spanish long before I had understood its virtues of the language and the society than produced it. “You had conviction but no power. You had a plan but no support! You acted too early, but this is no fault of yours, since the only alternative would be more of the same. You tried to break through into tomorrow, but your strength was not enough. So how about this? The great failure of your project was that you acted alone as you are. Even if I were to attempt the same, even my wealth will do little. The great problem with this town’s instruction is that it has only one teacher. The townsfolk feel brave enough to pressure you. Would they be so brave as to try and pressure a foreigner with white skin? Filled with the progressive power and culture of Europe and the Americas; those who care about putting people in their proper places, do they dare pit their traditions against the colossi that bestride the world? Money cannot buy loyalty. But enough money can draw the attention of even more self-righteous types (but of a more progressive bent) just aching to civilize the hinterlands, maybe to feel better about themselves in carrying the white man’s burden, maybe to prove stronger than the misfortunes of the world, maybe to do good simply for good’s own sake, and there is also virtue here. Much evil was done under this premise, yet also many good public works. It is a certain confident (to the point of arrogance) selflessness that is different from the white guilt that permeates instead this similar epoch in the next century. There are many who sit on the opposite face of the world, just as well as this teacher, all aching to burn with the fires of their own ideals. They only require the opportunity. Crispin looks up at me, with awestruck eyes. “I want to be rich…” he murmurs under his breath, even as he still pets and half-embraces Googol sitting by his side. Basilio frowns at me, and then shakes his head. ‘You are not finished’’, he wants to say, but politely demurs. And you would be absolutely correct, young perceptive one. But for that, we need to practice using certain equipment. I grin fiercely.